The Mandukya with the Karikas of the renowned Gaudapada, has exercised an irresistible fascination upon the minds of all truth-seekers. Students of comparative philosophy no less than aspirants after spiritual realization, have been drawn to it. The commentary of Shankara upon the Karikas’ throws a flood of light upon it and is at once illuminating and inspiring. 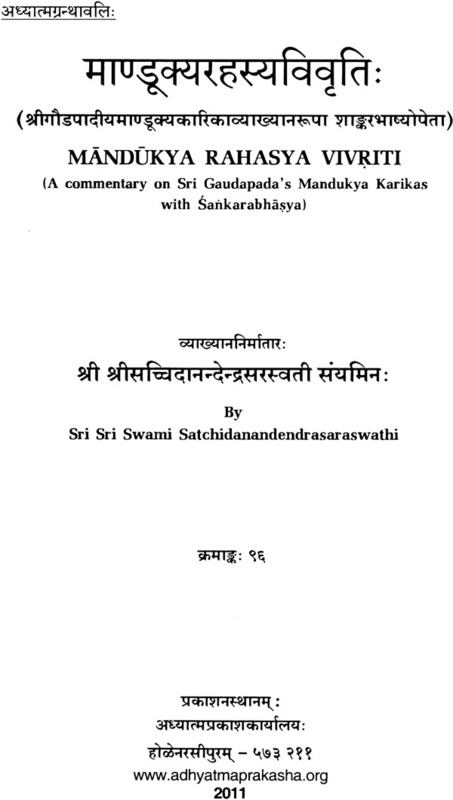 Swami Satchidananda Saraswathiji’s New Sanskrit Commentary not only lays bare every esoteric doctrine taught or implied in the Karikas, but also effectively removes all misconceptions that have gathered round Gaudapada’s teachings. 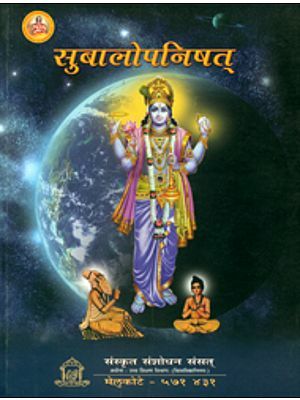 Besides incorporating and elucidating the whole of Shnakara’s Bhashya, the learned Swamiji has deftly woven out extracts from Shankara’s other Bhashyas into his work, so that every statement, while it is in itself an appeal to reason and experience, is also rendered convincingly authoritative. 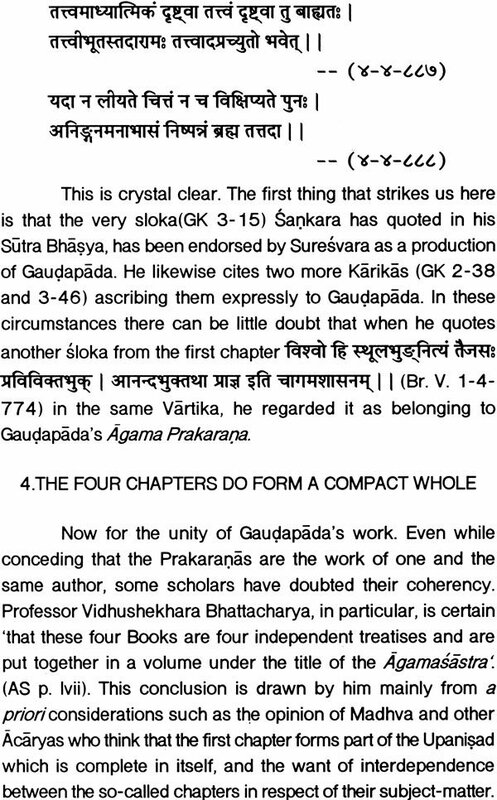 It may be confidently claimed that this is the first attempt of its kind to present both Gaudapada and Shankara in their true perspective. 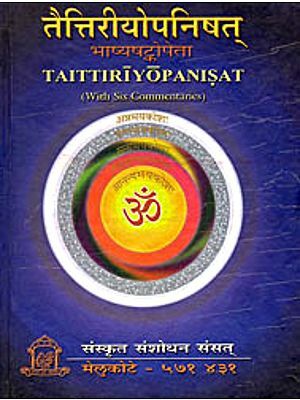 The fundamental difference in philosophy between the Vedanta of these two eminent thinkers on the one hand and the Mahayana teachers on the other, has been clearly brought out both in the English and the Sanskrit Introductions. 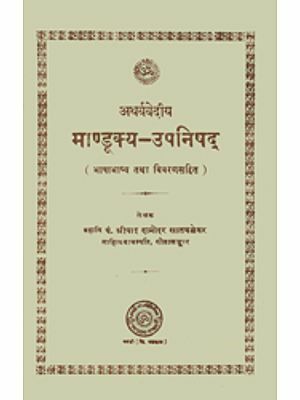 Three appendices and a Subject Index greatly enhance the value of this work, which is really a unique contribution to Vedantic Literature. 1. 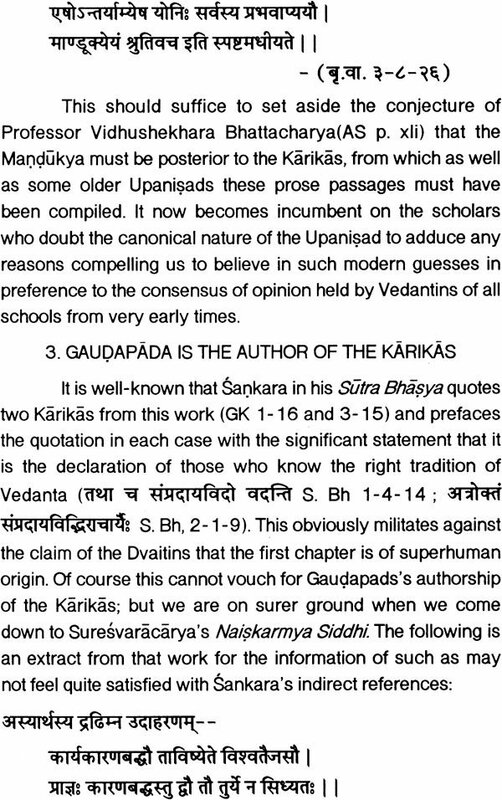 Gaudapada the author of the karikas on the Mandukya Upanisad, has proved to be a veritable riddle of the sphinx to research scholars. Was there an author of that name in existence at all? Presuming that he did exist, what was his date? What were his works besides the Karikas? 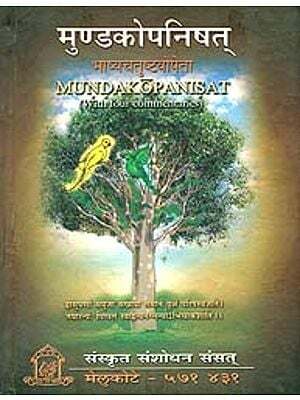 Is the Mandukya Upanisad so called, also to be counted among them? 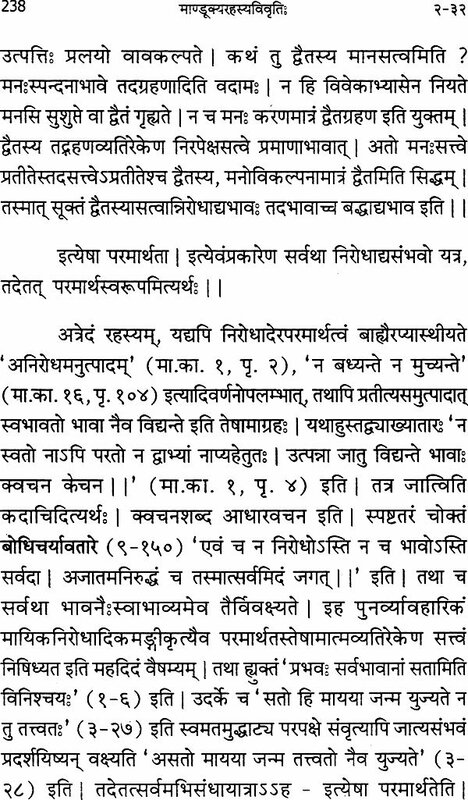 What is the relation between the Upanisads and the four Books embodying the Karikas? Are these Books themselves related to one another as chapters of one work, or are they independent treatises? 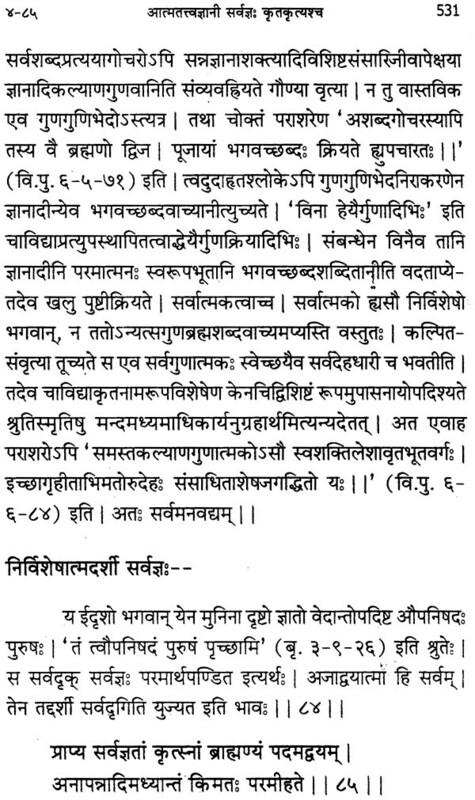 Does the Upanisad cover any portion of the Karikas also? 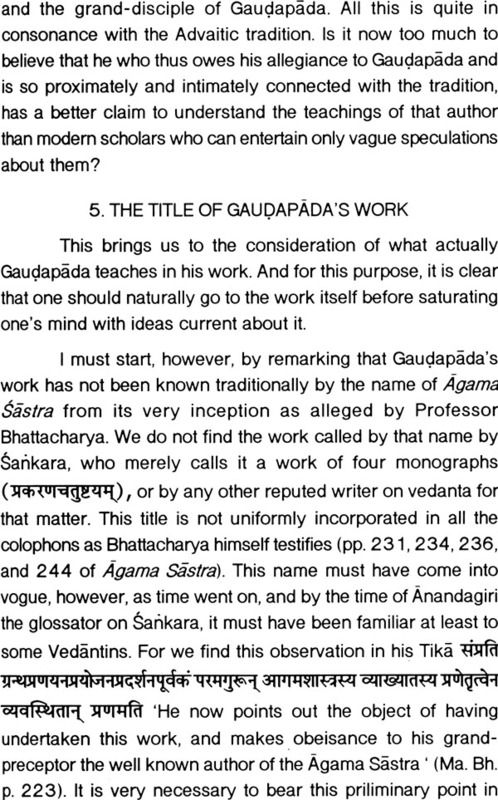 Further, is the fourth chapter a work, on Vedanta at all? How far is it indebted to Mahayanic works? Has Gaudapada any prior Vedantins of this tradition to back him, or has he struck a new pat altogether of his own? Is the commentator o the Karikas identical with the commentator on the Brahmasutras? How far has he correctly represented Gaudapada’s views? 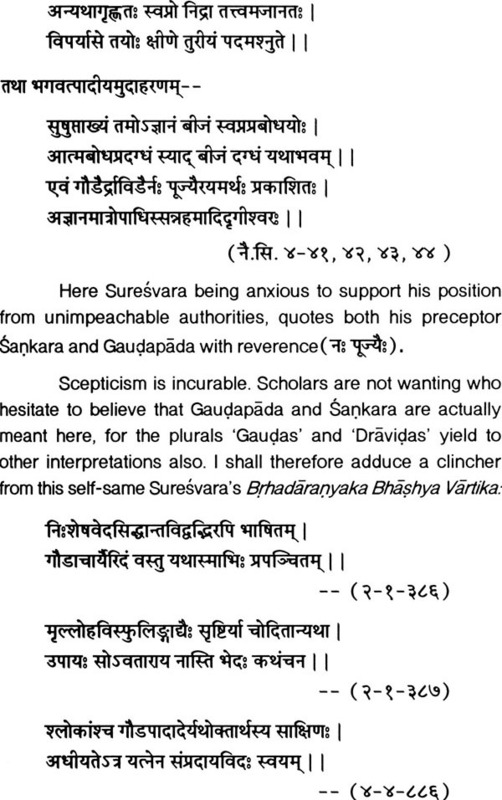 Do Sankaracary of the Sutra Bhasya and other subsequent Vedantins subscribe to all his teachings? Such are some of the problems that have exercised the best brains engaged in oriental studies. In my Samskrt commentary intended for the orthodox section of the earnest students of Advaita Vedanta, who have no misgivings whatever about most of these matters, I have generally proceeded on the principle that unless and until the universally accepted tradition has been finally proved to be baseless, there is no reason to trouble ourselves about the various incompatible opinions of theorists, or even about the various incompatible opinions of theorists, or even about the opposing views of recent adverse critics of Advaita from among the mututally different schools of Vedanta. 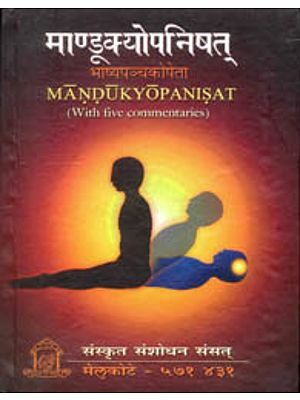 All the same, I propose to state here very briefly some of the reasons which have weighed with me in believing in the authenticity of the Mandukya Upanisad as well as the consistent inter-relation of the four chapters forming an organic whole in the shape of an exposition by Gaudapada of the philosophy of that Upanisad. I shall also try to examine some of the adverse criticisms against the orthodox view of Gaudapada, and place before the reader my own conclusions according to the light I have received. 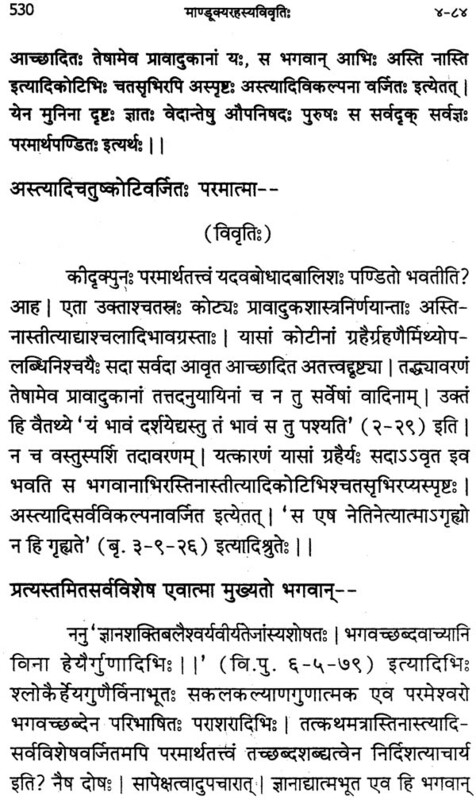 Sankara open his commentary with the remark that he is going to comment upon this work of four chapters(प्रकरणचतुष्टयम्) beginning with ‘This syllable Om’. The interpretation of this sentence, commonly received, is that the Acarya proposes to write a commentary on Gaudapada’s work consisting of four parts, and that the work itself is an explanation of the Upanisad beginning with ‘This syllable Om’(ओमित्येतदक्षरम् ). 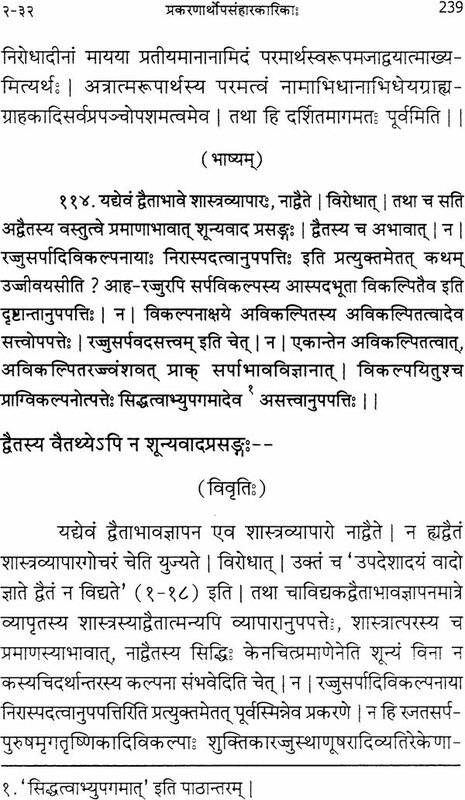 The ambiguous wording the sentence, however,(वेदान्तार्थसारससंग्रहभूतमिदं प्रकरण चतुष्टयमोमित्येतदक्षरमित्याद्यारभ्यते ) easily lends itself to being interpreted to mean that the prose portion is also included as an integral part of the work. And Deussen in his Philosophy of the Upanisads, has actually explained it that way, and in support of this supposition, he says that it squares with the fact that the Mandukya is not quoted either in the Brahma Sutras or the Bhasya there on. Fortunately, Sri Suresvaracarya, a direct disciple of Sankaracarya, has left us a verse in his Brhadaranyaka Vartika which settles the question once for all.